Saintly, “the horse from heaven” storms down the outside to defeat Filante (rails), All Our Mob (yellow cap) and Juggler (obscured) in one of the closest, most dramatic finishes to Australia’s WFA championship the WS Cox Plate Gr1 2040m in 1996. Saintly was bred, part-owned and trained by the legendary Bart Cummings, who gradually unlocked the key to the horse’s greatness as his career unfolded. By the Cummings trained Sky Chase out of the Sir Tristram mare All Grace, the beautifully named Saintly was a huge public favourite during his career. His epic battles with Octagonal have become part of racing folklore, narrow defeats on three occasions doing nothing to harm his reputation. 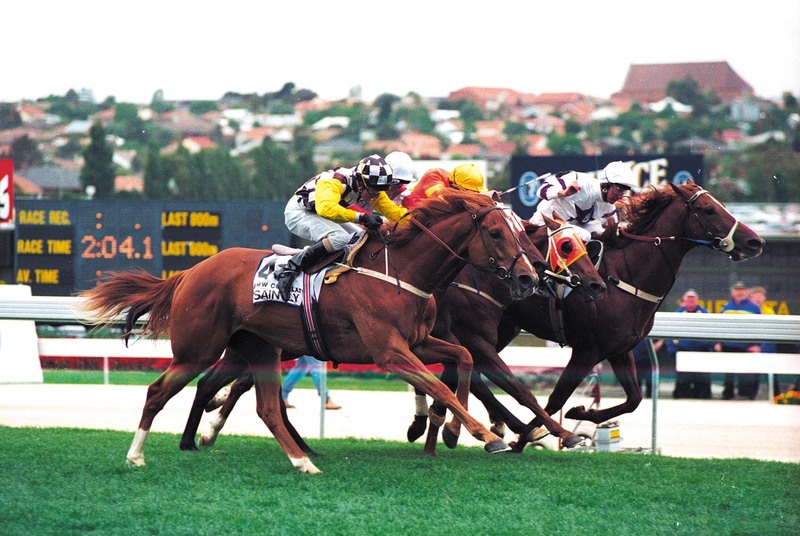 Saintly’s Cox Plate win started a remarkable run of three Gr1 wins, next being a seemingly effortless win in the 1996 Melbourne Cup Gr1, over 3200m, then first up from a spell a stunning victory in the VATC CF Orr S Gr1 over 1400m, Just when he seemed unbeatable, an injury brought his career to an end. Saintly was retired to a life of luxury on Bart’s beautiful Princes Farm in the Hawkesbury Valley where he passed away in early December, shortly before this issue went to press.